Act now and save an extra 5% when you sign up for Choice Privileges for Comfort Inn. Book early and save 20% off select hotels from Comfort Inn by Choice Hotels. Save up to 50% off hotel rooms when you book with Comfort Inn by Choice Hotels. 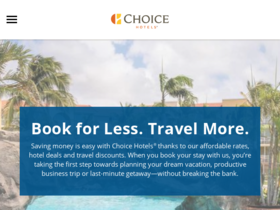 Check out Comfort Inn by Choice Hotels online for their latest special offers.